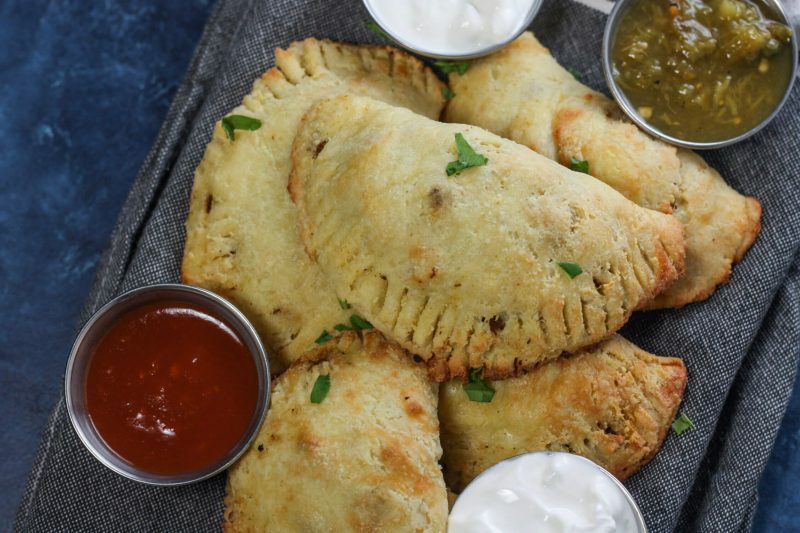 How to Make Empanadas: These Ground Beef Empanadas are made with a ketogenic and low carb fathead dough then filled with flavorful ground beef. The weather out here has been very confusing. It’s hot, it’s cold, it’s really hot, then it’s cold again. We’re not having a real winter, even by California standards, but the sunny days are broken up by bouts of chilliness. I’ve actually been enjoying the colder weather though. There’s something about a nice fire roaring in the fireplace, my comfy leather couch and a good blanket that will just warm your soul. Speaking of warming your soul, these Ground Beef Empanadas are definitely one of my favorite keto recipes. It’s really easy to make and so delicious plus super versatile because you can make all different kinds of flavor combinations. In a pan over medium heat, cook onions in 1-2 tbsp olive oil until slightly softened. Add in ground beef and break up with a spatula. Season meat mixture with chile powder, cumin and smoked paprika. Cook until browned. Add in salsa of choice and olives if using. Set aside. While meat is cooking, add mozzarella and cream cheese to a bowl and microwave for one minute. Take out and stir well, then put back in the microwave for another minute. Stir well. Add egg to mozzarella and cream cheese mixture and mix well. Then add in the almond flour and combine well again. Roll the dough flat with a rolling pin or with a piece of plastic wrap on top and use a wine bottles. Once you've rolled it flat, about ¼" thick, use a bowl to cut circle shapes. For excess dough, form into a ball then roll out again and repeat the process until all the dough has been used. Lay on a lightly greased cooking sheet, parchment paper or a silicone baking mat. Place a couple spoonfuls of meat mixture into each circle on one half and then fold the other half over. Make sure to press down firmly on the edges. You can also slightly roll the edges to make sure they're together well or use a fork to gently push down the edges. Once you've made all the empanadas, cook at 425 degrees for 12 minutes until starting to turn golden brown. 0 Response to "GROUND BEEF EMPANADAS (KETO, LOW CARB)"